SSL, a business unit of Maxar Technologies (formerly MacDonald, Dettwiler and Associates Ltd.) (NYSE: MAXR; TSX: MAXR), has partnered with a team at NASA’s Jet Propulsion Laboratory (JPL) and the University of Michigan (UM) selected by the agency to conduct a Phase A mission study under NASA’s Explorers Program. 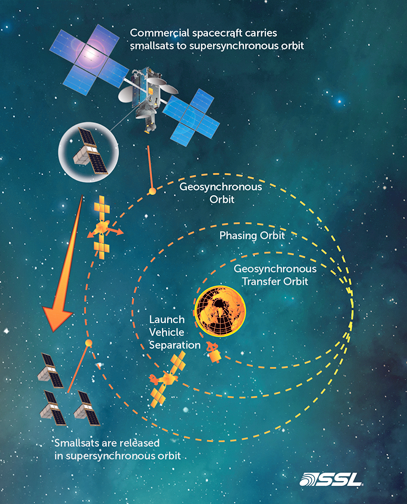 SSL’s role in the mission, called the Sun Radio Interferometer Space Experiment (SunRISE), is to provide a ride beyond geosynchronous orbit (GEO) for a constellation of science-gathering smallsats. SSL will use its Payload Orbital Delivery System (PODS) technology to dispense the small satellites on-orbit as free-flyers. By sharing a ride to space on an SSL-built satellite with PODS, the SunRISE mission benefits from the frequency of commercial launch schedules and a significantly reduced launch cost compared to a dedicated mission. SSL developed PODS in conjunction with the Defense Advanced Research Projects Agency, with the expectation that it will play a key role in enabling cost-effective, high tempo access to space for small payloads on a wide variety of important commercial, government, and scientific missions beyond LEO. Justin Kasper, mission principal investigator and associate professor, University of Michigan, said that using the PODS system for the launch gives the team the ability to deploy a constellation of smallsats beyond GEO orbit for a fraction of the cost of a dedicated launch, enabling mission implementations that would not have been possible just years ago.